I think everyone has moments when all they really want to eat is something familiar and comforting. One food that seems to do the trick every time is beans. Of course, there are so many different ways to whip up a big, hearty helping of beans and so many different kinds of beans that one could use that you might find fault with my choice, arguing that I need to be much more specific. But I think the beauty of beans, be they flageolet, haricot, kidney, fava, pinto or lima, is that everyone has a favorite way of cooking or eating them. My darling wife S, for example, is a huge slow-baked beans addict. My own favorite recipe comes from one of my first cookbooks, the small and easy-to-use Real Fast Food by British food god Nigel Slater. I discovered this amazing little paperback at Shakespeare and Company in Paris during the summer of 1994. I spent 10 weeks that summer “staging” at the International Herald Tribune. In Paris, I had subletted a tiny studio from a friend, a fellow-student who was spending the summer partying across Eastern Europe. The studio was little more than a tiny room with a bed, a shower and a kitchen. The kitchen, I should note, took up at least 30% of the whole apartment. So, as you can imagine, I spent a lot of time there. Real Fast Food was only the second cookbook I had ever bought for myself (the first was Molly Katzen’s awesome Moosewood Cookbook) and it became my best friend during that summer. I loved the fact that the book offered “350 recipes ready-to-eat in 30 minutes”. And since I lived just a short walk from a fantastic farmer’s market, I had no excuse not to work my way through the book. I still have my beat-up copy of this book, a Penguin edition printed in 1993. The corner of at least a dozen pages are folded over–my way, back then, of marking the pages that contained my favorite recipes. My favorite beans recipe is on Page 209, White Beans with Tarragon and Cream. It’s a lovely, herby creamy dish that works wonderfully on its own, with toast or with any number of meats. This is, of course, one of the great things about the best beans recipes–that they taste great with a vast variety of things. Recently, because S knows that I have a preference for white beans, she decided to come up with a recipe to serve alongside some beautifully fresh lamb racks that we had bought at the Swiss Butchery. It was tasty and earthy, spiked with carrots, onions and celery, and braised with chicken stock that’s been flavored through the addition of a nice, meaty ham bone. It was even better the next day. For breakfast, I couldn’t resist heating up some more of the braised beans. Having spent the night in the fridge, the bean’s flavors had become more balanced and more nuanced. I sliced up and pan-fried some bratwurst and topped everything with a poached egg. It was a wonderful, hearty breakfast, made especially so served with a glass of iced coffee. Begin with 225g dried flageolet beans, picked over and rinsed. Cover the beans with 500ml water. Soak them for 8-12 hours, then drain. Put the beans in a large sauce pan with another 500ml water. Add 3 cloves of garlic, bruised; and 1 bay leaf. Bring to a boil, skimming off any scum that rises to the surface; reduce the heat and simmer for an hour or until cooked. Store the beans in the remaining cooking liquid if you don’t intend to use them immediately. Drain the beans and add to the stock. Next, add the carrots, onions, celery and garlic. Bring to a boil, then simmer for 45 minutes or until most of the liquid has been reduced. Adjust seasoning (salt and pepper) to taste. If you can, cool and refrigerate overnight. Reheat before serving. The breakfast does look great! Can I ask how you go about making such beautiful looking poached eggs? Thanks! You know, I am beginning to think there’s a group of us with a thing about eggs. I noticed that we add eggs to almost everything. That looks so good that even though I am not bean keen, I might just try it. hi, chance upon ur site. can i ask what camera you using? u took ever so classic pics of your food! Thank you for sharing that recipe … it sounds comforting and delicious! I need to get my hands on a copy of Real Fast Food – I’ve heard nothing but raves from so many different people whose taste I think is on my wavelength. Braised beans, baked beans, however you make them, they’re delicious. These look lovely. my god. your photos are always so fantastic. 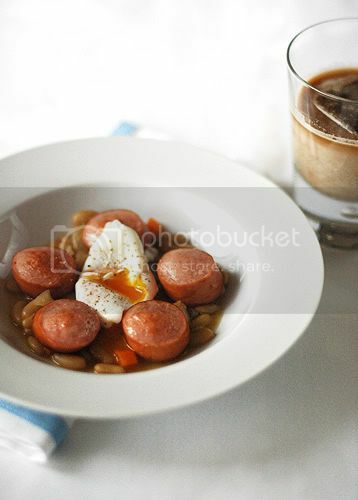 i’m not usually a big fan of english breakfast beans and such, but this looks absolutely mouthwatering. you’ve done it again! if only you weren’t already someone’s hubby, i’d probably propose. please cook for me. Nigel Slater is one of my favourite food writers along with Nigella Lawson. They both serve such robust, homely cooking. Gosh you can make beans look and sound so romantic..
my favorite egg dish has to be spam, fried eggs and rice (with soy sauce). It’s a hawaiian comfort food. MM: I love eggs on anything! Anonymous in Cannes: Thanks. I use a Nikon D70 with a Nikon 50mm 1:1.4 lens. Rosa: Heh… It’s only one of 2 or 3 good butchers in town. And the one I always go to. It’s owned by a Swiss family and is actually called “The Swiss Butchery”. Anonymous: Thanks. Glad to know I’m not the only one fussy about my yolks. Luisa: All of Slater’s books are awesome. I like Real Fast Food because it’s tiny. You can toss it in a carry-on and bring it with you on vacation. Ztransmissions: 🙂 Thanks! Totally flattered. Gastrochick: Thanks. I love Kitchen Diaries. I really like the very “real” food pix throughout the book and the woodfree paper they use. Eatdrinkbmerry: Yum! Eggs, spam and fried rice is totally delicious. And a pretty popular comfort food around here also. Vivilicious: Oh you lucky thing. S and I have been thinking about starting an Asia-Pacific Blogging By Post… we’ve gotten so jealous reading about what you Europeans have been getting in the mail. Hey Chubby Hubby, great idea! Been looking at the Euro Blog Post and all and was getting very jealous. However, I’d really like to find some Norwegian blog post partner so I cn get some of the really interesting looking local delicacies. But an Asian blog post is a brilliant idea!